This is my first indicator from a series of Pinescript Indicators. And ofcouse supertrend is one of my favorite indicator. So love to take this opportunity to code it in Pinescript supported by Tradingview charts with huge community following. 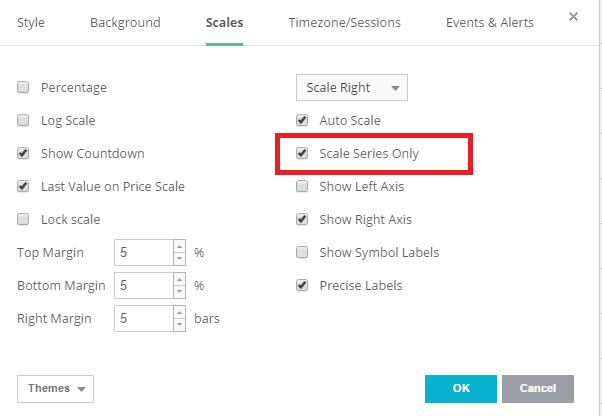 Do the scale settings as shown in the image below. I am unable to apply supertrend indicator in Amibroker.. When I try to edit the formula it shows error?? Last week i was seeing EOD charts with RSI and stochastic RSI signals but now i have lost site where i can see these charts now? kindly inform on my mail if possible. Can you please provide “tradescript” code for Supertrend indicator ? What is the timeframes to use with this indicator? 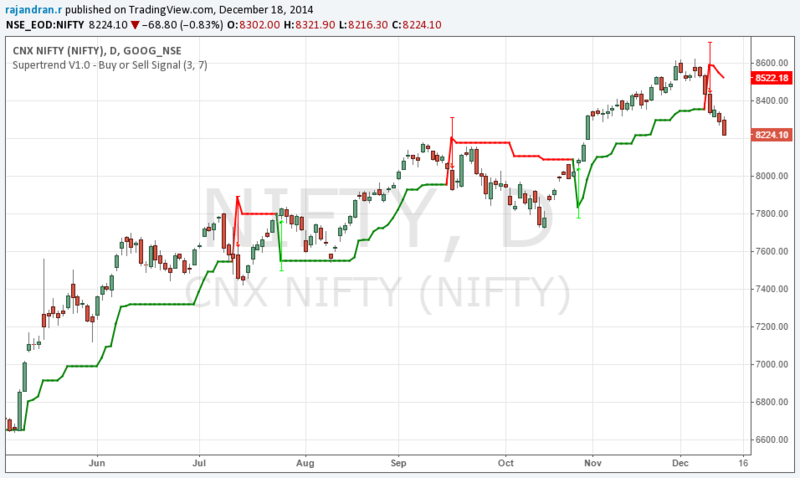 i m using trading view for trading in nasdaq. i have also subscribe for trading view live data for cme. i m using ur super trend indicator. pls help me to convert super trend indicator code base to strategy code so i can back test and foreword test in pine script. I have just come across your SuperTrend V1.0 script and it’s awesome. What’s the current version and can I have it? Can you tell me if the Supertrend V1.0 -- Buy or Sell Signal indicator is available for MT4? If so I would like to carry it over to my broker platform for ease of execution. I found your script about Supertrend indicator very interesting. However, the is something in it I do not understand. Perhaps you could leave me some lines. The calculation of variable TrendUp uses TrendUp. But this previous TrendUp seems to me that is never calculated. For example, there is no “once” statement. How is TrendUp getting its first value in the script? Once I understand where this first value comes from, I will fully understand. Initally TrendUp sets with null values automatically. So TrendUp is initialized to null and rest other calculation does in recursive mode. Wonderful work, can you please share latest script v4 for TradingView? I can see only v1 in your page also in Trading view? supertrend v4 is not codeable as of now in Trading View due to pinescript feature. May be in the later days. I am using your Supertend script v1.0 in the free version of Tradingview. I wanted also the default MACD indicator alolng with your Supertrend. I treid to modify your script, but getting some error.